I'm back to regular blogging! If you follow me on Instagram you'll have seen I've been posting bits and pieces of things in the last couple of weeks, but haven't had time to blog with the holidays. For Christmas, my family got me the Distress Oxide collection and I also got a good handful of Nuvo Drop colors. 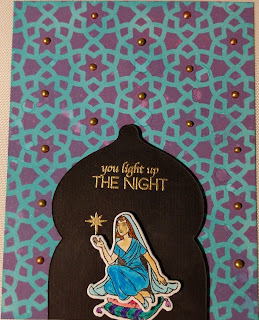 I started the card with a 5.5x4.25 piece of Bristol cardstock and covered in the Peacock Feathers ink and did a few half sprays with the Distress Sprayer. I heat set it and then layered the December (now sold out) My Monthly Hero stencil on top and bounced Seedless Preserves on top. I few more sprays on top of that. After it was dry I put Gold Nuvo drops in the middle of each star shape of the stencil. For the focal area of the card I used black cardstock and included die in the kit to create the area for my girl to sit on the pillow. 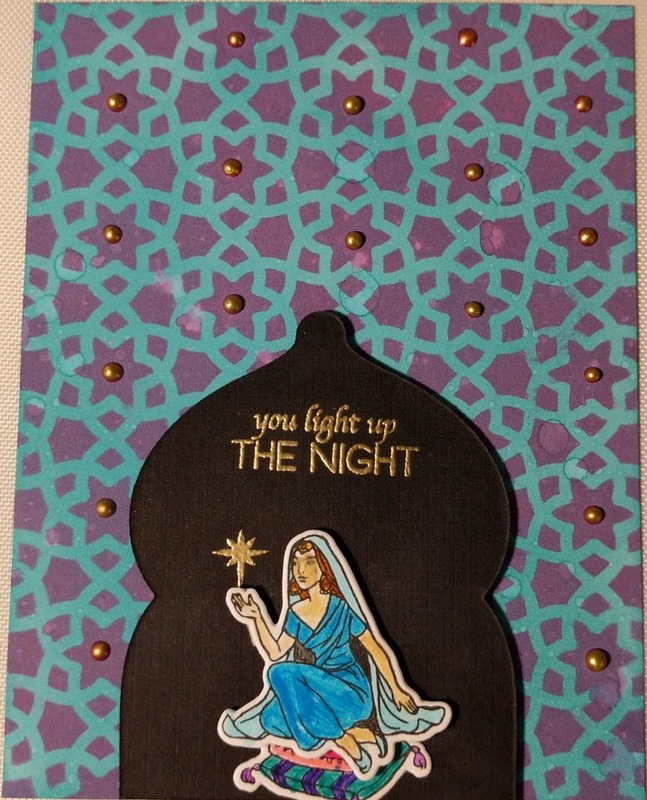 I colored those in with Zig Clean Color markers (the duo tip ones) I die cut them and placed them on the card I stamped the star in her hand and the greeting and heat embossed with Hero Arts Gold powder. I attached it to the card base with foam tape.